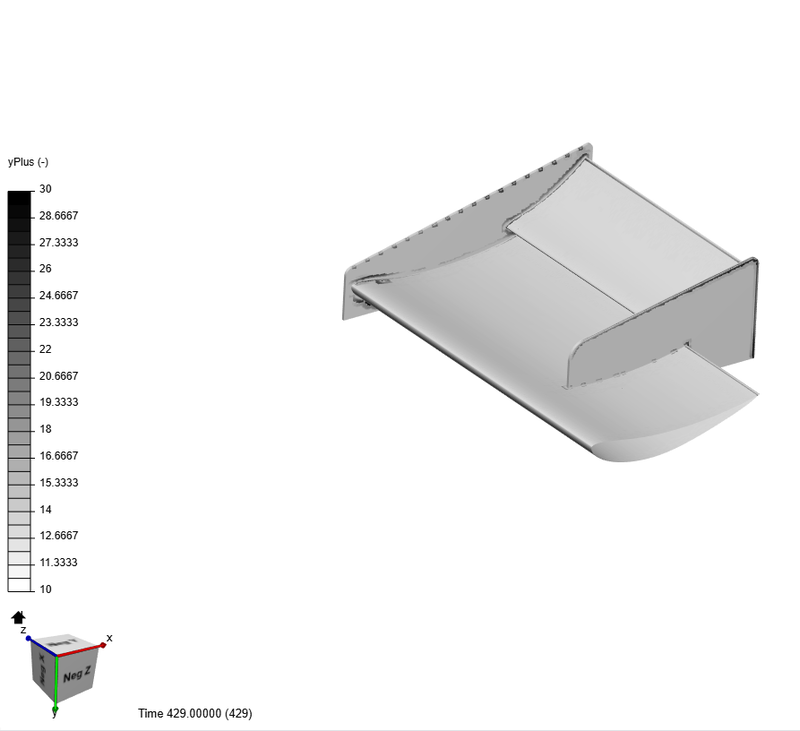 I am doing a mesh study for a external aerodynamics wing of a fsae car simulation. 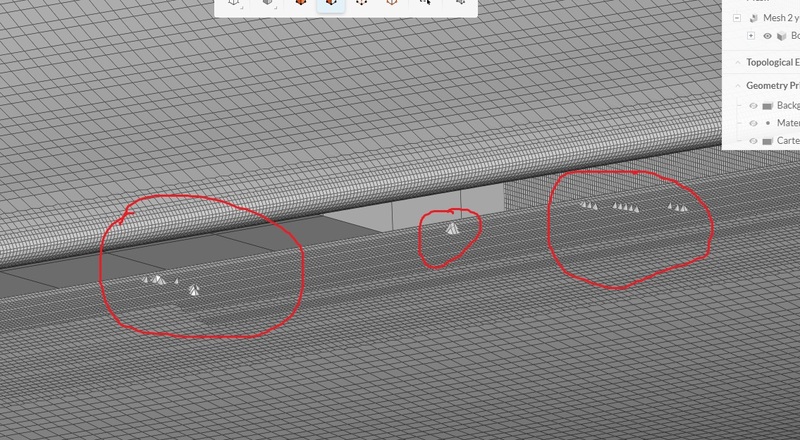 I found a problem in this cells of the mesh surface and don´t know what changes I need to do to fix this cells. I have already tried to change the values of the surface refinement level, feature refinement and bounding box resolution but it did not resolved the problem. I uploaded screenshots of the cells. 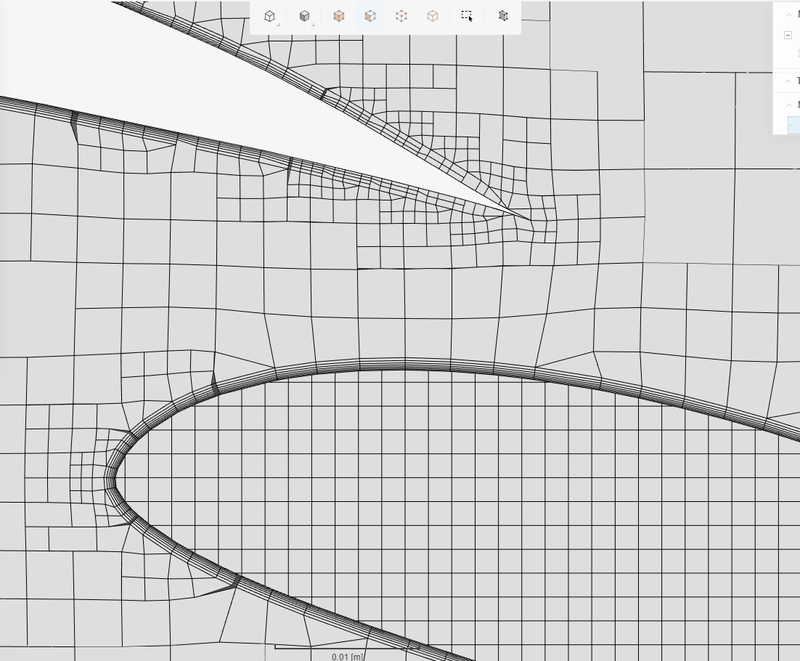 @math_marques96 have you tried turning off various features of the mesh to see where the problem is starting? 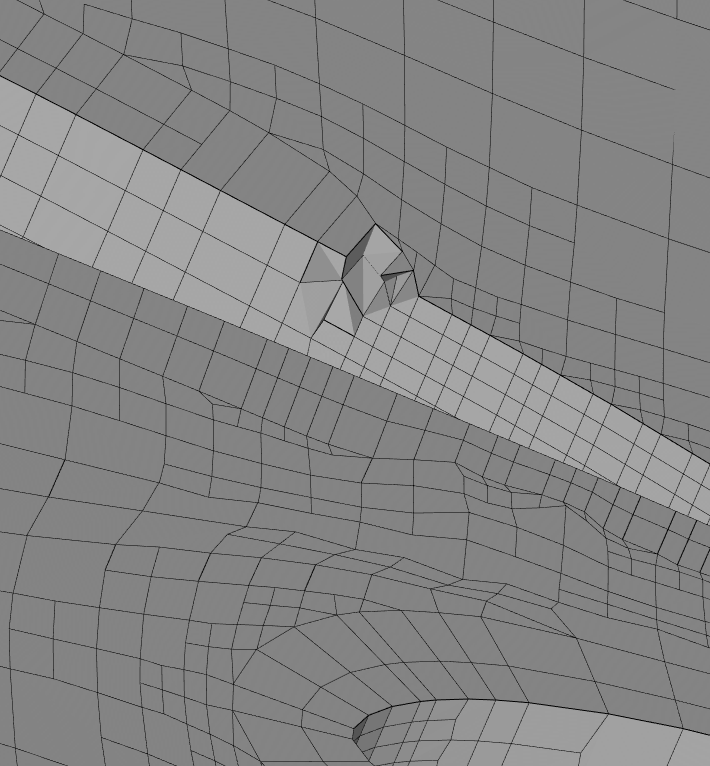 I might try turning off layer extrusion first or possibly some of the refinement regions. One other quick note, while that mesh looks really nice, it might be a bit of an overkill; just my opinion. 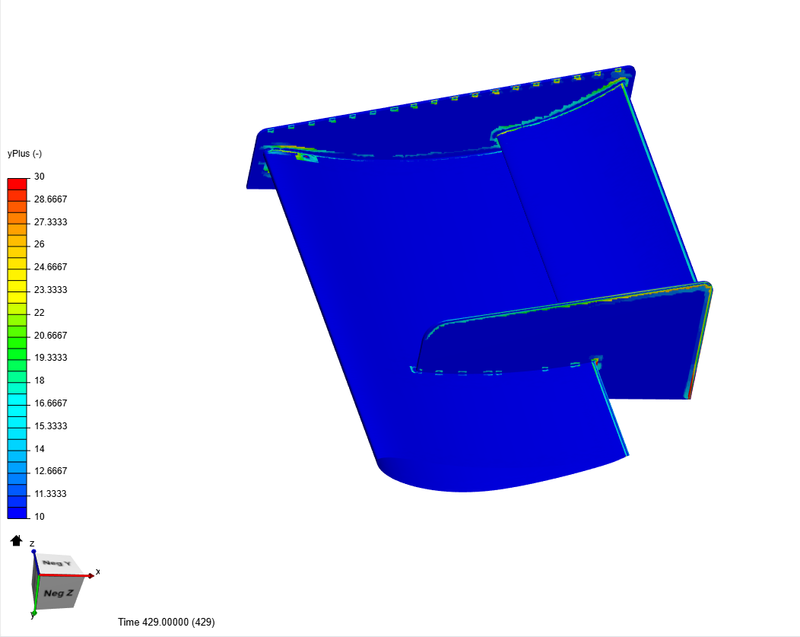 Have you run a mesh refinement study? The problem is with the inflation layer. These bad elements are present where the prism layer cells end. I recommend you to improve the inflation layers. Aha, if it is ‘bad’ Snappy prism cells causing these bumps then this may be a case where you could try INCREASING certain default quality checks that Snappy uses when deciding which of the perfect prism cells to keep, otherwise is there an actual ‘bump’ in the geometry there? No sir, I verified that there is no imperfection in the geometry. The problem is with the inflation layer. I made a new mesh with better inflation layer settings and it solved the problem. Great! Looks good but I see still some pretty nasty gradients from prism cells to the volume cells which I have been led to believe causes issues with results accuracy (maybe another reason to use ‘Relative layering’???). The yplus value on the surface seems to be good . Yup @Lwhitson2 is absolutely correct about the yplus value for k-omega SST model. The shear stress transport (SST) k-ω model is a two-equation model that combines the advantages of the k-ε and k-ω models. 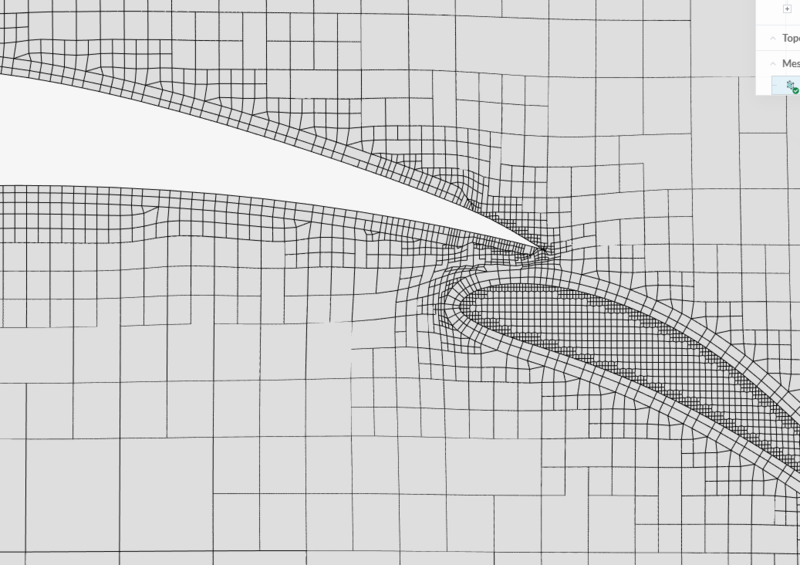 This model uses a blending function to gradually transition from standard k-ω in the inner boundary layer to standard k-ε in the outer boundary layer. The standard k-ω model performs better in the near-wall region while the standard k-ε performs better in the free-stream region. Also, there are not much cells with yplus between 10 &30. 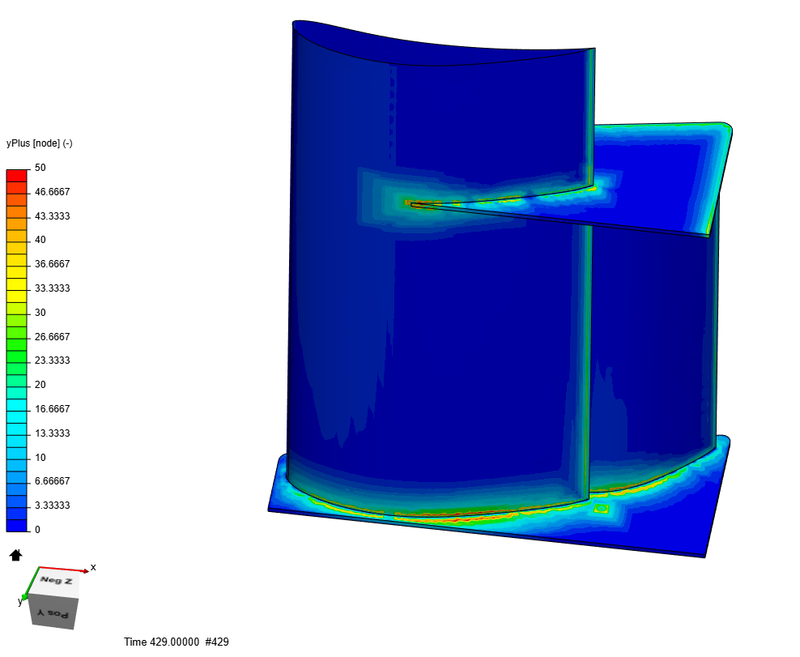 These Wall treatment method are used by some other CFD software. Just wanted to share this with you guyzz. 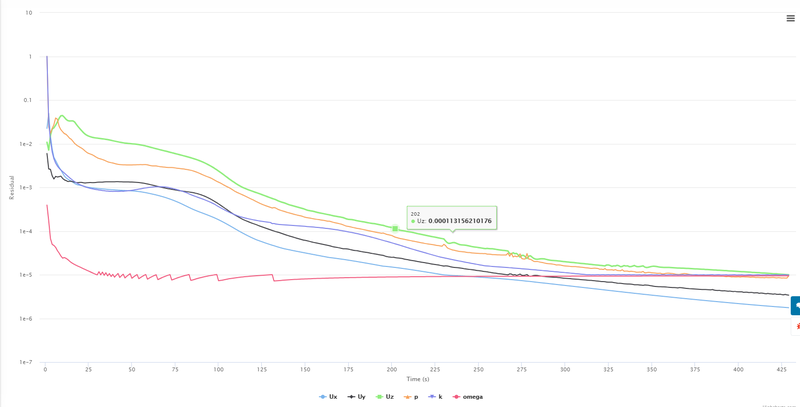 @DaleKramer you’re never going to get a perfect Y+ value everywhere on your model. The key is to get Y+ correct in the most important parts of the flow. Overall I think the Y+ looks really good on this simulation after @anirudh2821998 made his updates to the mesh. Yes but I do not think I could easily see that from Ani’s first Y+ mapping presentation. The second mapping of 10<Y+<30 does confirm this for me. 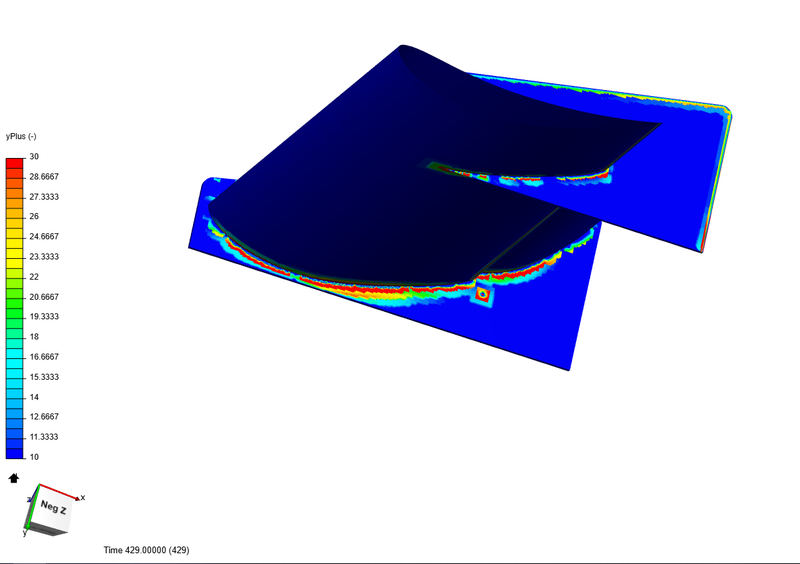 EDIT: And just to confirm, this will be a Full res Y+ simulation, correct? Sir, Is this what you are suggesting?? Well, there is a white to brown color scheme but I can’t see any raibow type color scheme. Did you use some other post processing tool? I did add the ‘Gray is y+<1’ text in an image processor tho. For this inflation layers parameters you used relative layering? 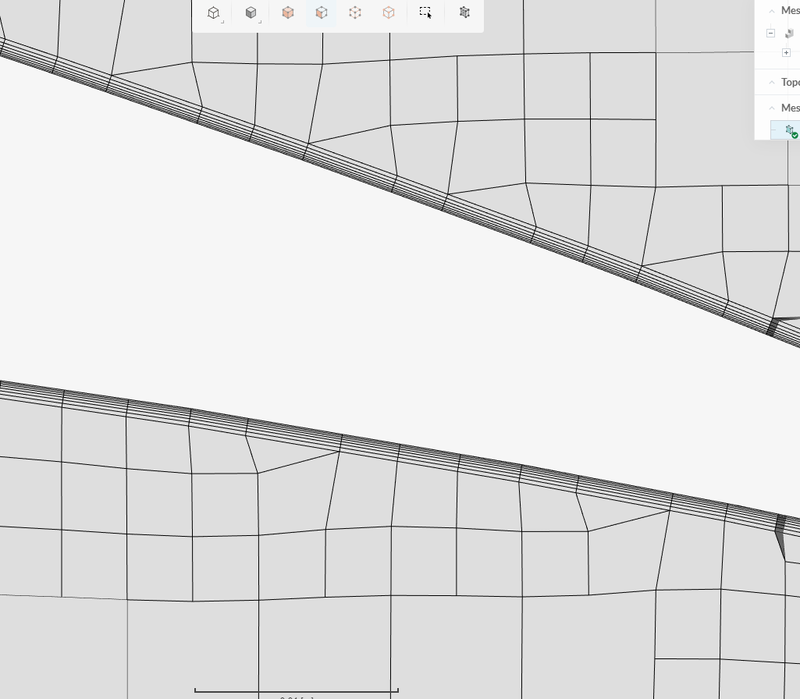 And this layer calculation is for a full resolution right? 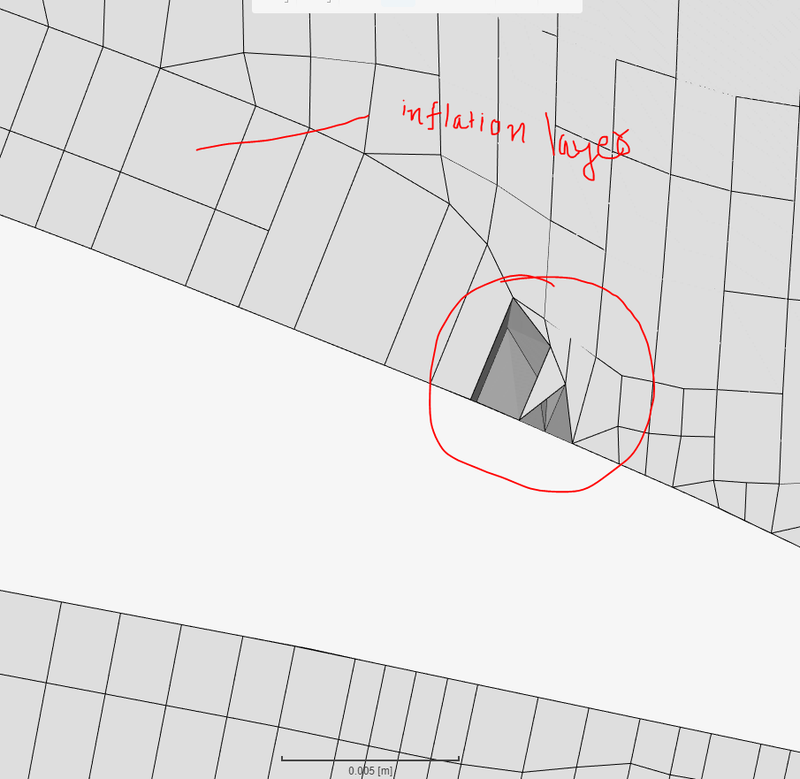 Did you just changed the inflation layers parameters? Would it be good to alter the surface refinement level, region refinement level or the bounding box resolution in Ani´s mesh to have a smoothier transition from prism cells to region cells? 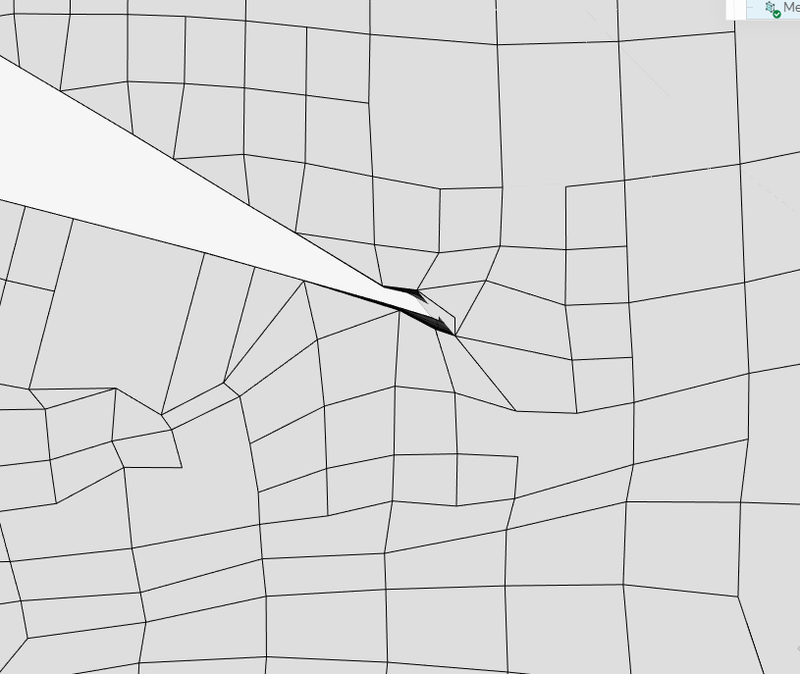 I just modified the size of the bounding box(made it a bit larger) and changed only the inflation layer parameter. 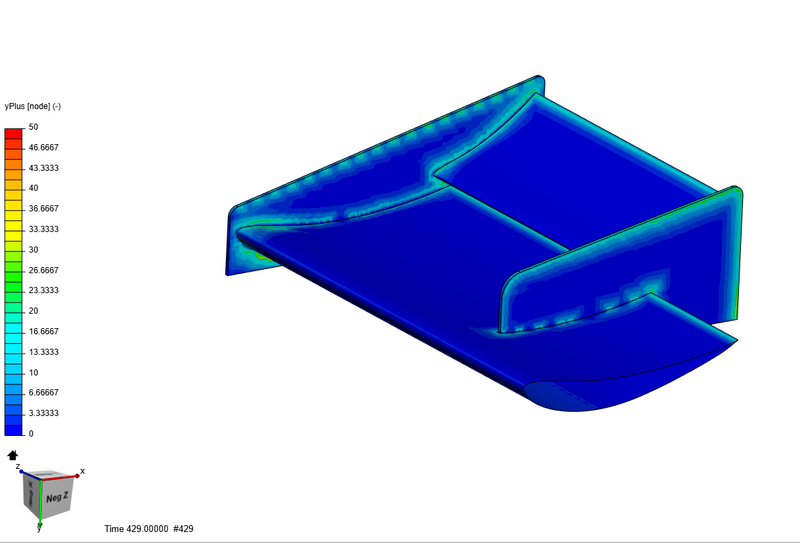 It is a must to simulate your problem with atleast 2 different quality mesh. 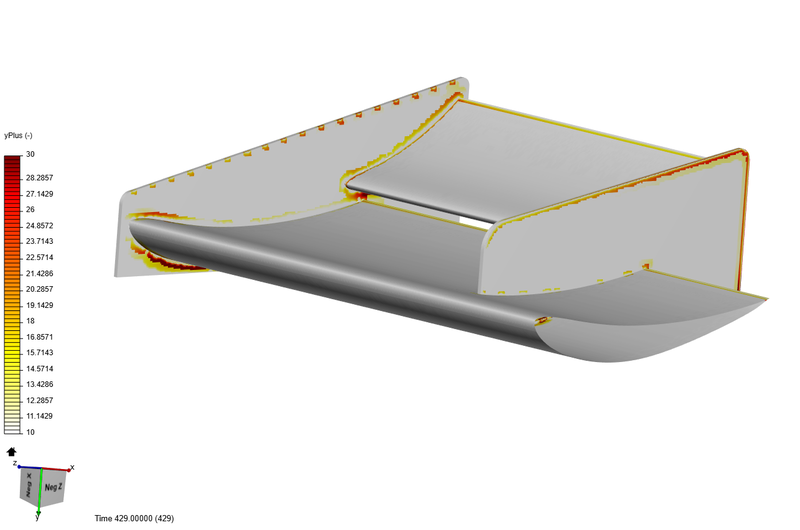 This will provide you with an idea of the deviation in results with mesh fineness and will also serve the purpose for mesh independence study. To add to this, I would suggest running a full grid convergence study using at least three grids and verifying the order of convergence for your model. This would satisfy the scientific/research level requirements and is great experience to have in validating your model. Here is a link to a great article by NASA that will help you in the calculations. Near the bottom is an example of the grid refinement study.